Baltimore, Maryland | November 30, 2010 | Fred Moeslein, PhD, MD, Assistant Professor at the University of Maryland School of Medicine, has been recognized by Elite American Physicians for his dedication, achievements and leadership in interventional radiology. As the first interventional radiologist in Maryland to successfully perform an irreversible electroporation (IRE) surgery, Dr. Moeslein brought both irreversible electroporation (IRE) and percutaneous hepatic perfusion (PHP) techniques to the University of Maryland. Currently, Dr. Moeslein has been serving as the interim section head of the neuro interventional radiology department at the University of Maryland. Attributing his success to his hard work and dedication to his patients and education, Dr. Moeslein enjoys the opportunity to provide his patients with cutting edge treatment. A firm believer in working hard and doing right for every patient, Dr. Moeslein earned a Doctorate of Philosophy (Ph.D.) and a Doctorate of Medicine (MD) from Case Western Reserve University in 2001. He proudly completed a fellowship in vascular and interventional radiology at the University of Maryland and his Residency in diagnostic radiology at the Cleveland Clinic. He holds a certification in medical scientist training and retains affiliations with the Society of Interventional Radiology, American Medical Association, American Academy of Sciences, Radiological Society of North America, Inc., and the Cardiovascular and Interventional Radiological Society of Europe. 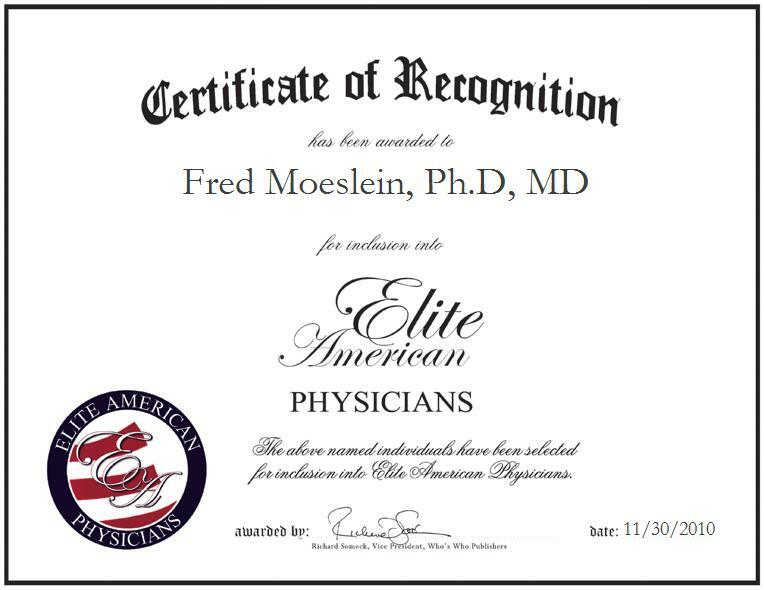 For more information on Dr. Moeslein and his accomplishments, please visit his personal website at http://www.fredmoeslein.com.